The main approach to the hospital site is from the main roundabout which is deemed to be also the existing entrance to the site. A landscaped avenue is designed from the main road on the west, leading to the main entrance of the Hospital Site, passing by an external car parking for the visitors and patients. From the main entrance building, this avenue leads to the elevated main entrance deck of the Hospital Building, bisecting the site into two main zones. The zone on the north is for the residences and dormitories, and the one on the south is for the main hospital building and technical annex buildings. One of the main objectives is orientation of buildings, considering the climate of the region, most of the spaces are oriented towards either north or south, to minimize heat gain. Main entrance at the west of site. There is an entrance building at this point for control and security, comprising offices and waiting room for visitors. Service and resident staff entrance at the north of the east border of the site. There is a small building for control and security. Accident and Emergency entrance. 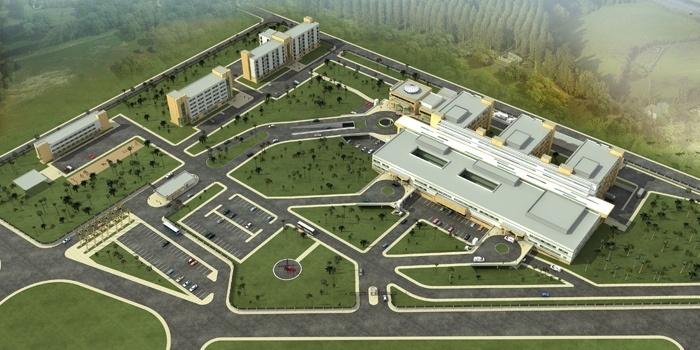 A seperate entrance for the ambulances is proposed for undelayed and rapid access to the A/E department. There is a small building for control and security. In addition, provision is made for service vehicles at service entrances, service buildings and mortuary. 1. An imposing entrance to the Headquartes Building and a secondary entrance to the Convention Hall and Library through the forecourt deck. A very limited car parking is dedicated to VIP's on the deck level; on the other hand an extensive parking is dedicated to staff under the deck. 2. 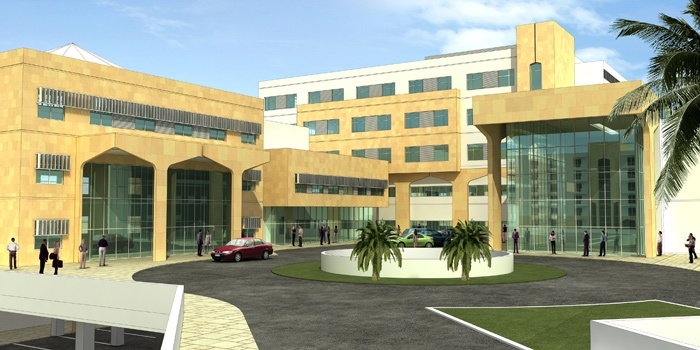 Main Entrance for patients, visitors and staff. Patients and visitors will come to the main entrance from outside, from dedicated parking or from lay-by point through entrance forecourt deck. Specific lay-by provision has been made for dropping-off patients and disabled persons. Staff will come by external stairs and elevators from under-deck parking. 3. OPD Entrance: It is at one end of the main building block to separate the ambulatory patients coming only for exam, consultation and diagnostics. 4. A/E Entrance: It is at the other end of the main building block to separate patients coming only for A/E cases. There is a dedicated parking for ambulances and emergency vehicles. This entrance will also be used as the main entrance after office hours. 5. Service Entrance: There is a loading dock with access to the kitchen, central stores and technical rooms and an exit for garbage in a sunken service courtyard. There is also a separate and concealed exit for the deceased. 6. Staff Entrance: This entrance from parking in front and under the entrance deck of OPD is generally for staff other than physicians. 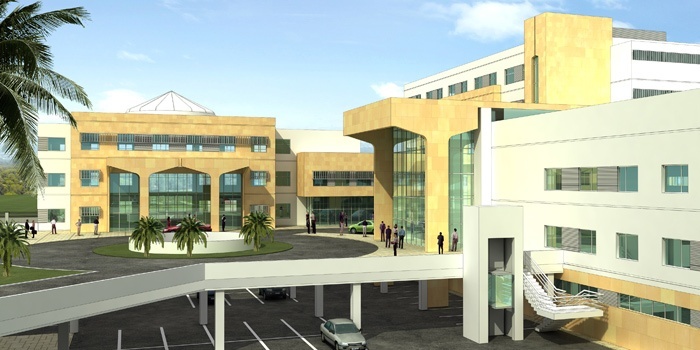 Physicians will be using the main entrance. 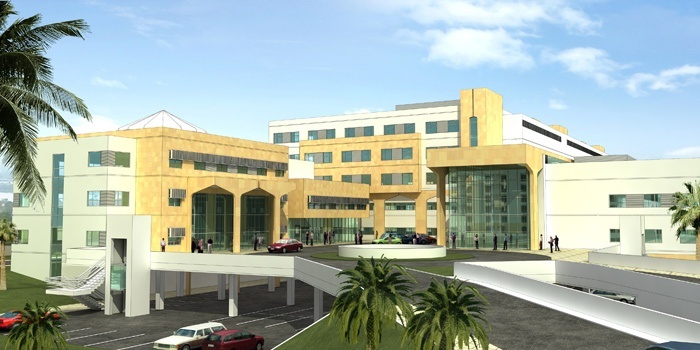 The hospital building is composed of seven main blocks; HQ block (3 floors) and Convention Center and the Library block (2 floors) in front defining a forecourt, three nursing unit blocks (5 floors), the block comprising OPD, A/E, diagnostic, surgical and special care departments (2 floors) and the enclosed hospital street starting from a majestic main entrance (3 floors), and a basement throughout the hospital building. Considering the sub-soil conditions and to reduce excavation, a half basement is proposed which made the main entrances accessible from elevated decks. All departments were designed self-contained with their own inner circulation and entrances and fire exits (as applicable), carefully located to be under control of a Nursing Station and/or Reception Desk. 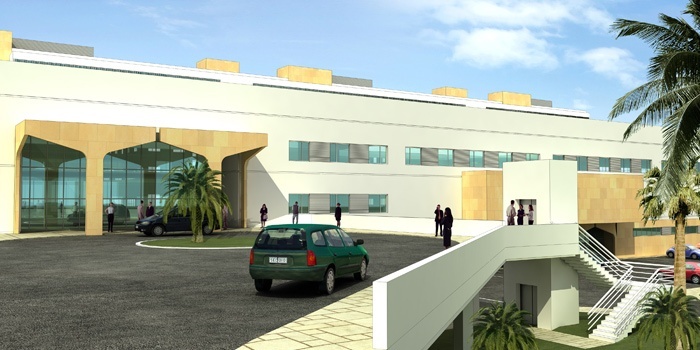 The main objective was to achieve a compact layout for efficient use of staff and equipment alongside a main hospital street which connects all the main departments to each other. This space which with skylights increases the architectural quality, gives a sense of comfort in a controlled environment in a hot climate and also makes the building easy to read and comprehend. 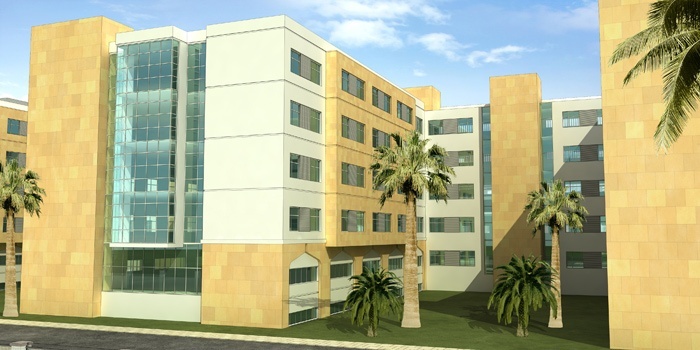 (7 beds), Physical Medicine, Detainees' Unit are located on the ground floor. Designing diagnostic departments such as Imaging and Laboratories between the Out-patient Department and Accident&Emergency and very close to patient elevators had been another primary objective, especially for the immediate reference of A/E to the Imaging Department. 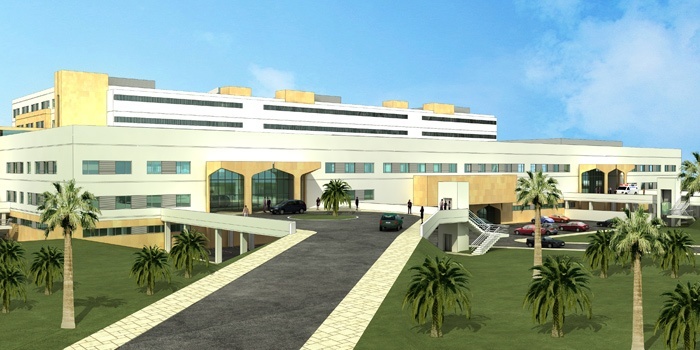 General Surgery Nursing Unit, Urosurgery, Cardiovascular Surgery, Plastic Surgery (5 beds in the wards) , (ICU (10 beds), CCU (20 beds), RCU (10 beds), Angiography (5 beds), Burns Unit (5 beds as intensive care ), Operating Department, Management are located on the first floor. To have all these departments close to each other on the same floor not requiring any vertical circulation, had been another primary objective. Second floor comprises Neuro Surgery, ENT, Ophthalmic Surgery and Orthopedic Nursing units, total number of beds on this floor is 93. Third floor comprises 93 Internal Medicine beds. 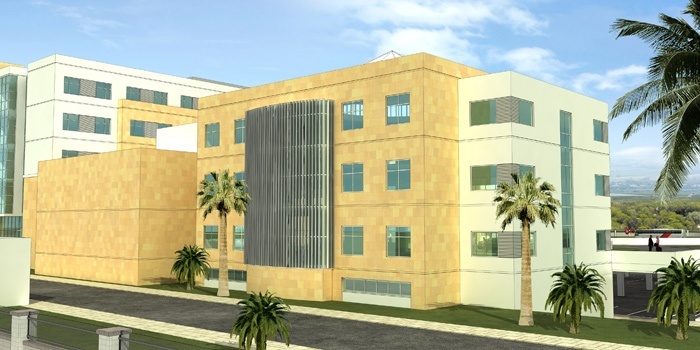 Fourth Floor comprises 22 Internal Medicine beds, Dental Unit, Medical Rehabilitation, private rooms and VIP suites. 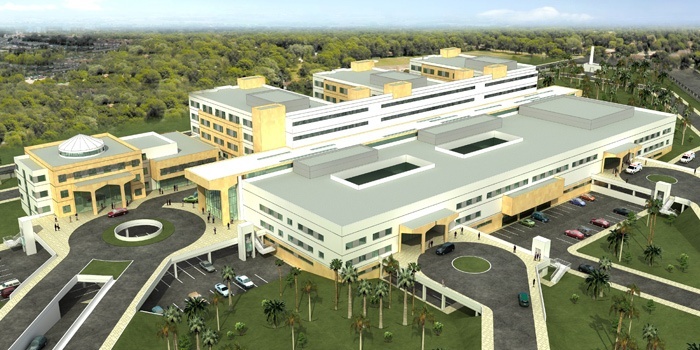 Basement comprises main kitchen and staff dining, staff change, laundry, central sterilization, pharmacy, housekeeping and central stores, medical records, technical and maintenance rooms. Sterilization Department is located below the Operating Department for direct dumbwaiter connection. 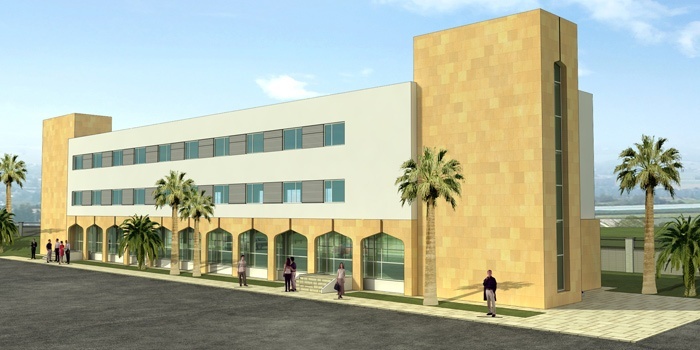 Seperate buildings for transformers and generators, medical gases, water tank, incinerator are allocated along a service road between the main hospital building and the east border of site in close proximity to the technical areas in the basement. Chillers are also allocated in this area. There are enclosed staircases along the main hospital street for each ward which also function as fire escape staircases. There are also fire escape staircases at the end of each wards block. There are adequate number of fire escape staircases in the other parts which can also be used for internal circulation. Inbetween the blocks 2 sets of two elevators are designed for patients. There is a provision for two passenger elevators for visitors and staff. Provision is made for two service elevators for each ward block, one for clean and the other for soiled, each opening to specail rooms. A specal staircase and elevator are provided for direct link of A/E Department to Operations Department. As mentioned above, Sterilization Department is located in the basement below the Operating Department to inter-link them directly with two dumbwaiters: one for sterile, the other for soiled equipment and material. 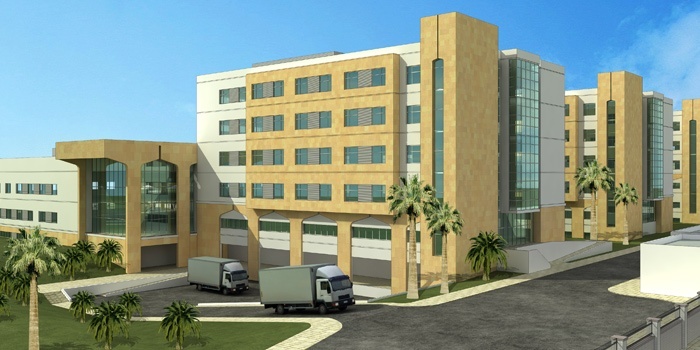 The nursing units block is a double corridor system with services in-between, which reduces circulation time within the department and specialization of rooms. This also enables separation of circulation, if one corridor being mainly for visitors, the other one being for circulation of in-patients, staff and services. The design is based on a grid mainly of 7.2m by 7.2m or 6.30 and 5.4m. The structure is reinforced concrete flat slab frame structure. The external walls are 20+5 cm insulation+10 cm brick cavity walls. The Internal main department and corridor walls are 20 cm brick, all other partition walls are metal stud, gypsum board. The exterior concrete surfaces will be rock wool boards finished in plaster and paint, cavity walls willl be partlystone cladding and partly plaster and paint as seen in the drawings. Glass curtain walls will be special heat glass with insulation at parapets and spandrels. 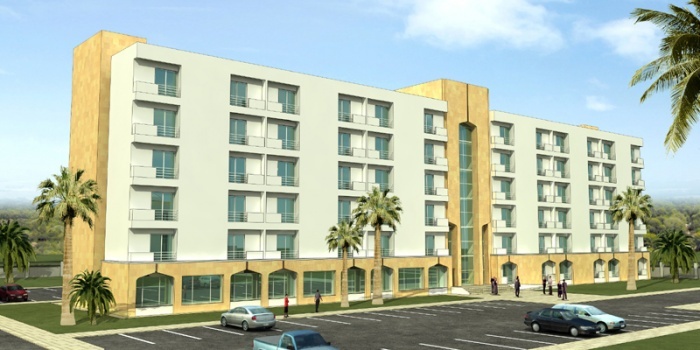 Doctors' Dormıtories: All male and female doctors dormitories are proposed in one block of 6 floors in three wings; two equal wings for males and one smaller wing for females. A core of two elevators and a central staircase is provided which seperates the female from male wings There are 11 male units in one of the wings, the other wing is dedicated to lounge, dining and service kitchen, and the smaller wing is dedicated to office, security, laundry and storage spaces. In 5 floors above, there are 22 male doctor's rooms and 4 female rooms, 121 male rooms and 20 female rooms in total of the building.. A common living room is provided on floors 2-5. 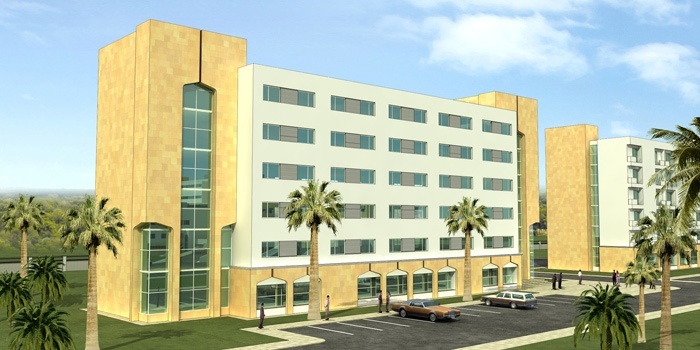 Medical Staff Dormitories: 100 double bed rooms are provided in one block in the top five floors of 6-floor block. Total no of beds is 200. On the ground floor, common facilities such as lounge, dining, service kitchen etc.are provided. The top floor, or as may be required, can be dedicated to female staff. Barracks: This is designed in three floors for NCO's. NCO's with higher ranks are on one side, and the enlisted on the other side. On the ground floor common facilities as lounge, dining, service kitchen are provided. On the two floors above, 12 beds for higher ranks, and 36 beds in bunks for enlisted (soldiers) are provided on each floor, totalling to 96 beds. 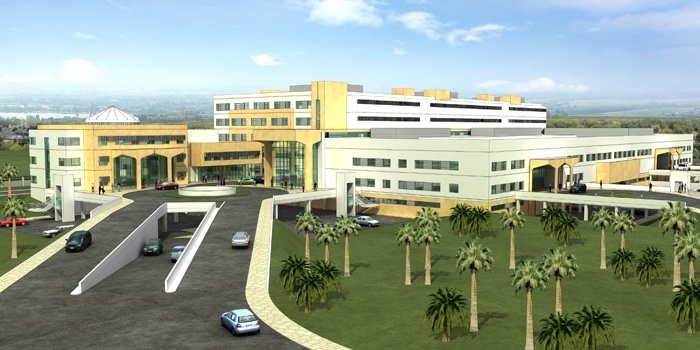 General: The main construction materials of these buildings will be similar to the main hospital building, except that internal partition walls will be brick or concrete block. 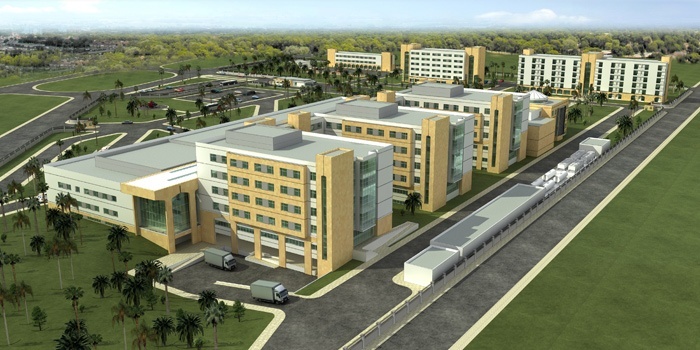 Provision is made on the Masterplan for the extension of Doctors' and Medical Staff Dormitories by repeating the blocks as the Hospital expands.